7 different sports, 85 participating countries and 98 sets of medals awarded – the 22nd Winter Olympic Games have ended. Sochi 2014 has been a true festival that has given us some fantastic sports moments. Records have been broken and new sports heroes have arisen. Sochi 2014 is said to have cost over $50 billion, setting the record as most expensive Olympic Games ever held. But that is just one Sochi 2014 figure – here are five other figures. The value of a gold medal won in Sochi. This is the value of the 525 grams of silver and 6 grams of gold the gold medal is composed of (see picture above). Obviously the real value goes beyond this. Depending on the story surrounding the medal, the condition and rarity of the medal, the price will vary. Recently a gold medal won by Jesse Owens at the 1936 Berlin Games was purchased for a record $1.4 million in an online auction. These days the golden (just as silver and bronze) athletes can cash in on their achievements by signing lucrative marketing contracts. Offers will be coming in for all these athletes. The bonus a gold medal winner from Azerbaijan is awarded. Unfortunately for the athletes none of them won gold, or any other precious metal, at Sochi 2014. Ukraine and Belarus did win gold medals, one and five respectively, and each gold medal winner will be awarded an impressive gold-bonus of $150,000. The number of medals host nation Russia won at their own Olympics. With that amount Russia won the Sochi 2014 medal count. Although the much-desired gold medal in ice hockey was not for the Russians, they topped the table with most gold medals – 13 to be exact. The Netherlands won one medal per 1.75 participants. With a delegation of just 42 the Netherlands performed extremely well in Sochi with 24 medals. All but one medal came in long track speed skating. The Dutch were clearly dominant in the speed skating-dome winning 64% of all medals awarded. The record number of medal sweeps during Sochi 2014. Surprisingly two of them, Russia in men’s cross-country and Norway in women’s cross-country, had their medal ceremony at the closing ceremony. The other sweeps were for the USA in men’s slopestyle skiing, France in men’s freestyle ski cross and four for the Dutch in speed skating. Previous story A ‘Grand Slam Dunk’ or not so much? Since 2013 scoreandchange.com offers insightful stories, case studies and analyses to people interested in sports business. The articles touch upon topics such as (digital) sports marketing, fan engagement, sponsorship and sports startups. 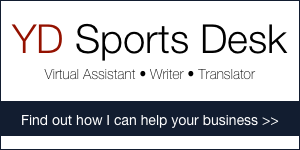 You can also find an overview of sports business conferences and major sports events on the website. Score and Change is part of YD Sports Desk. Accept them by clicking "Accept" in the banner. Score and Change © 2019. All Rights Reserved.